For those looking for a peaceful retreat devoid of all disturbances, look no further than the lovely Villa WV BRI. 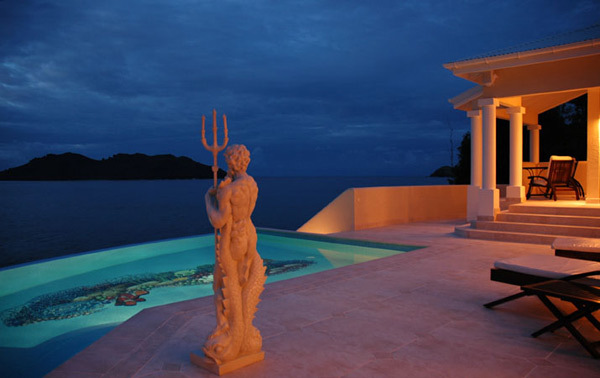 Located in the quieter side of St. Barths, this Anse des Lezards villa is the perfect place to unwind. Perched among the rocks in the Anse des Cayes area, Villa WV BRI offers stunning views from its serene setting. This delightful two-bedroom villa is perfect for two couples looking to hideaway on St. Barths. Both bedrooms feature king-sized beds with ensuite baths and stunning ocean views, so you can enjoy the beauty of the island from the moment you open your eyes each morning. The picturesque infinity pool is just the place to spend sunshine-filled Caribbean days. With a statue of Poseidon guarding over the pool’s glistening water, you can enjoy the scene with a rum drink drenched in lime as the wonder of a day on St. Barths surrounds you. Lounge on the covered terrace and be awe-struck by the sublime ocean view as it pours out toward the horizon before you. Only a minute from Anse des Cayes beach, you can opt to pack a picnic and a book and lounge amidst the sand and sea, as the caressing trade winds waft through the sunny days.